download the simple mail-in order form below. 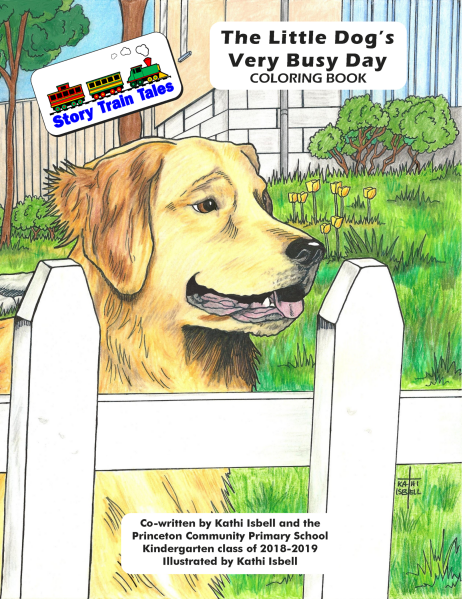 ​When you combine storytelling with the imagination of children, plus the art and creativity of Kathi Isbell, you can end up with a fun, and sometimes silly, Story Train Tales book! As you turn the pages, please don’t expect sensibility. Prepare to sit back and enjoy a little fun compiled from story lines drawn from over 150 enthusiastic Kindergarten students as we tell the story of The Little Dog's Very Busy Day in this format that allows your child, grandchild, student ... or even you to color the images that tell the story! A portion of the proceeds from the sale of this coloring book will benefit Princeton Community Primary School, Princeton, Indiana.